Gorgeous, sweet, ripe strawberries fresh from the berry patch! The beautiful essence and aroma of strawberries with a burst of flavor that can't be surpassed! 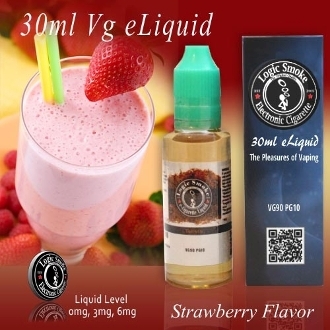 Logic Smoke Strawberry electronic cigarette e-liquid is a perfect stand alone e-liquid. It also mixes with so many other of our Logic Smoke flavors, so you can create your own taste explosions. You won't be able to resist! Mix with our White Chocolate e-liquid for a sensual white chocolate covered strawberry pleasure. Or with Cheesecake, or with any of our Logic Smoke berry or fruit blends. The possibilities are endless with this e-liquid! !